In the U.S, Aloe vera has been approved for the treatment of soft tissue cancers in animals and also for the treatment of leukaemia in cats. 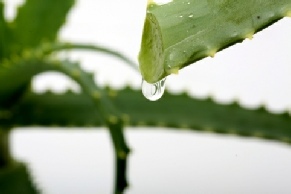 Studies have shown that the large polysaccharide molecules from Aloe vera produce Tumour Necrosis Factor, which enables the body to shut off the blood supply to tumours. This offers great potential for the treatment of human cancer in the future and it is already being used to treat AIDS in Europe. Aloe vera has also been shown to have anti-inflammatory properties (salicylic acid) which may help conditions such as arthritis and inflammatory bowel conditions eg Crohn’s Disease. People suffering with gastric reflux have also found benefit from sipping Aloe vera juice as it quickly reduces the burning sensation by neutralising the acid. Known as an adaptogen, Aloe vera is able to recognise the differing needs of the body. It has been found to lower high blood pressure, yet is also able to increase low blood pressure to normal levels. Those suffering with constipation find that Aloe vera helps to increase bowel movements, yet those with diarrhoea find that it reduces them. Diabetics have also found that their blood sugar levels are better controlled when taking Aloe vera, therefore reducing insulin or hypoglycaemic medication. This is due to the polysaccharides in Aloe vera which allow insulin to bind more efficiently to its receptor sites in the body. Other benefits include improved blood and lymph circulation which help to remove toxins more efficiently from the body, and improved wound healing with less incidence of infection. There are now many suppliers of Aloe vera but they vary in the quality of their product. It is therefore important to find a high quality product to receive maximum benefit. The liquid preparation should contain at least 90% Aloe juice, be totally organic, be free of preservatives or artificial colours, flavours or sweeteners and not be diluted with water. Aloe vera has been known to benefit health for thousands of years. The first recorded use of this plant, a member of the lily family, was around 1500BC in Mesopotamia. The Egyptians and Greeks have also recorded its use as a treatment for burns, wounds, and infections. There are 200 varieties of Aloe but only four have nutritional benefit. It grows in dry areas in Africa, Asia, America and Europe. Aloe vera has undergone much research over the years which has been able to prove the amazing health benefits of this cactus-like plant. Over 200 active compounds have been identified including a range of vitamins and minerals, enzymes, essential fatty acids and polysaccharides. Aloe vera is able to modify the immune system which may help prevent immune system diseases such as Rheumatoid Arthritis or Lupus Erythematosus. Also, with a strengthened immune system, our bodies are better equipped to deal with the hundreds of pre-cancerous cells we manufacture each day.